Finaccord's report titled Affinity and Partnership Marketing in UK Motor and Breakdown Recovery Insurance represents the most detailed research ever undertaken on this sector. 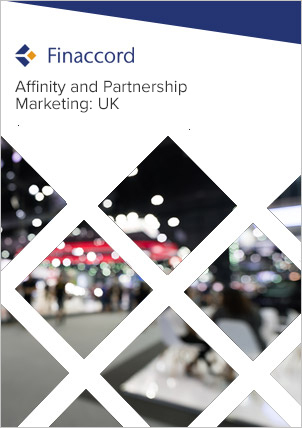 Drawing on the results of a survey of 2,555 organisations, the report analyses the penetration, operating models and provider share of relationships of affinity and partnership marketing schemes for motor and breakdown recovery insurance across a range of distributor categories. These include: automotive manufacturers; banks; building societies; charities; friendly societies; internet, media and telecoms entities; online aggregators and brokers; professional associations; retailers; trade associations; and trade unions. Moreover, the PartnerBASE™ database that accompanies the report provides the granular detail behind the analysis, detailing each of well over 500 affinity and partnership marketing initiatives traced by Finaccord in this sector. In addition, the analysis identifies not only the providers of motor and breakdown insurance with the most partnerships (overall, and within each category) but also computes 'weighted provider shares of partnerships' in order to highlight the providers that are likely to hold the most valuable relationships given the characteristics of their partners. plan your future affinity and partnership marketing strategy in motor and breakdown recovery insurance armed with the best market and competitor intelligence available on this subject. Together, the report and PartnerBASE™ database will provide you with the definitive guide to current and potential affinity and partnership marketing opportunities in UK motor and breakdown recovery insurance. Note that in this report, motor insurance is defined as policies sold to consumers owning standard cars. As such, it excludes motor insurance for business customers (consideration of which is instead included in the sister report and database titled Affinity and Partnership Marketing in UK Commercial Non-Life Insurance) and niche vehicle-related insurance such as GAP and tyre insurance. Moreover, it also excludes insurance for caravans, classic cars, mopeds, motor cycles and vans, plus short-term motor insurance policies, each of which are covered in a separate series of studies for which the series prospectus can be seen here. However, it includes telematics-enabled car insurance. In a similar vein, the definition of breakdown recovery insurance is roadside assistance contracts sold to consumers owning mainstream cars; in the case of insurers (including those defined in the research both as ‘underwriters’ and as ‘tied / multi-tied agents’), this considers cover bundled within wider motor insurance policies. Bundled cover is also the focus in the case of packaged accounts albeit for all other distributor categories, analysis of breakdown recovery insurance is limited to stand-alone policies only.